The Trinity Men’s golf team competed last weekend in the New England Small College Athletic Conference (NESCAC) Championship qualifier. The Bantams took their talents to Lyman Orchards Golf Course in Middletown, Connecticut as the qualifier came to Wesleyan University’s home course. After two days of competition, the Bantams finished in 2nd place by just one stroke behind Middlebury College. Since men’s golf is a two-season sport, the championship for the NESCAC is in the spring, while the qualifier for the championship is in the fall. Trinity’s tri-captain senior Will Rosenfield (Baltimore, MD) was awarded medalist honors after shooting an impressive two-day, five-under-par total of 139 (69-70). 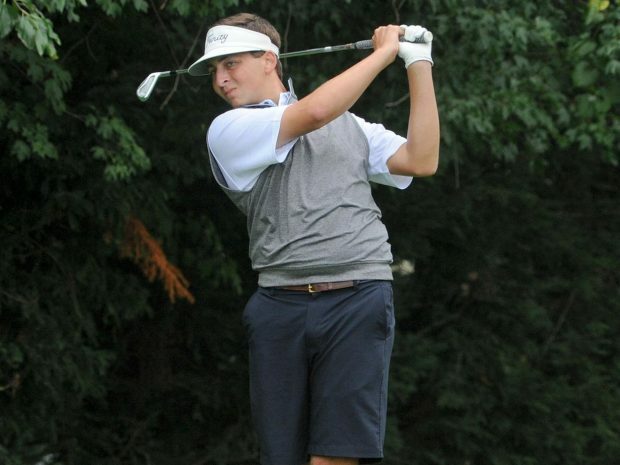 He finished three strokes ahead of Hamilton College’s Thomas Graham. Rosenfield was tested with a very wet course and muddy conditions but overcame tough conditions to outlast the impressive field. Coming in tied for 11th place was Trinity tri-captain Jack Junge (Lincolnshire, Ill.), who shot a two -day total of 149 (75-74). Senior tri-captain Taylor Kay-Green (Needham, MA) and classmate Nick Branchina (Summitt, NJ) both finished at tied for 16th place at 150. Rounding out the team was sophomore Ricardo Paes Leme (Lake Villa, Ill) with a two-day total of 154. One highlight came from Will Rosenfield, who faced a tough bunker shot on the par-5 18th hole on Saturday’s round. Rosenfiled hit a massive drive to set himself up for a 210-yard second shot which he pushed to the right of the green in the bunker. He was faced with a tough bunker shot but calmly landed the ball in the only spot suitable for a tucked-away pin. His ball came to rest about three feet away from the hole, in which he successfully made birdie to shoot -3 69. Last season, the Bantams hosted the qualifier and ended up dominating the field, paving the way for a 2018 NESCAC Championship trophy in the spring. The host course of the championship in the Spring is determined by the winner of the fall qualifier, yielding potential for a home-court advantage. The NESCAC Championship will be hosted at Middlebury’s Ralph Myhre Golf Course. As for the rest of the season, the Bantams will compete for the “Sap Bucket” at Ekwanok Golf Club on Tuesday and will travel to Skidmore’s tournament the next weekend.